We all have favorite objects that we enjoy, some because they are beautiful and some because they challenge our skills as observers. What better way to enjoy them than to share them with others! This page lets us do precisely that. The first two observing targets below have been provided by expert observer Myron Wasiuta and the seasonal tour plans were developed by long time scouting coordinator Glenn Holliday. Share your own night sky objects. Develop writeups about your favorite interesting and challenging night sky objects and email your submissions to the RAC Web Editor. of my favorites, and it has captivated me on many summer nights. This star is non other than the famous prototype of the cataclysmic variables -- SS Cygni. SS Cygni is a binary star; however, both components are much too close to be resolved from earth in any telescope. In fact, they have one of the quickest rotation periods known-just 6.5 HOURS! This means the stars must be nearly in contact. It is this binary nature that accounts for this stars unusual behavior. According to theory, one component is a solar type star and the other a white dwarf. 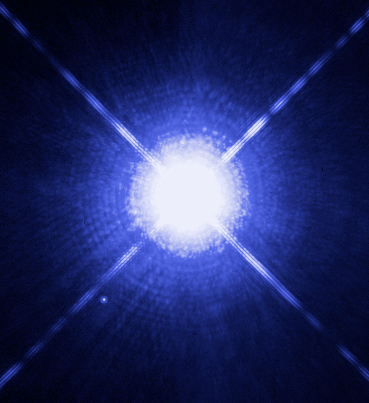 The gravitational field of the white dwarf pulls material off the outer atmosphere of the larger star. This material spirals down onto the surface of the white dwarf, and when certain conditions of temperature and pressure are met- BANG-the star explodes. Here on earth we see the star brighten suddenly. There are two general types of maxima-one lasting about 8 days and the other about 18 days. These two types usually alternate, but sometimes similar maxima types can reoccur. to show you where it is. If we get some magnitude estimates from club members, I will forward them to the AAVSO, which is always interested in your observations of variable stars! Located in the rich starclouds of Sagittarius is the gossamer nebula M20, also known as the Trifid Nebula. A beautiful sight in its' own right, the object of our challenge this month is actually the multiple star system HN 40, which lies within the heart of the Trifid. In small telescopes at low power, HN 40 appears as a prominent double star at the tip of one of the lobes of nebulosity. It is near the geometric center of the Trifid. The brightest member is magnitude 6.9 (star "A" in my sketch which is mirror-reversed because a star-diagonal was used), and about 11 arc-seconds to it south is the second brightest star at magnitude 8.8 (star "B"). These are the two stars most observers are familiar with. However, anyone who has taken a closer look at the heart of the Trifid may have noticed something else. Examine this double at medium or high power. I would recommend at least 200X. If the seeing is good, you might be able to pick another fainter star just to the north of star "A", the main star in this system. This star, labeled "C" in my sketch, is magnitude 10.6, and located only 5 arc-seconds from the primary. That makes this at least a triple star system. However, we are not done yet. While examining this system with my 6.1" refractor, I also caught glimpse of a fourth star! Decidedly more difficult, I was nonetheless certain of its existence. Located just about 2 arc-seconds to the west of star "B" in the sketch is a faint companion, about magnitude 10.5. This may seem pretty bright, but keep in mind it is deeply embedded in the brightest part of the Trifid's nebulous glow. You will only see this star if the seeing is good, and your telescope has clean, well-collimated optics. Maximizing contrast is the name of the game to detect the 4th member of this interesting system! When I first observed this star last summer, I was unaware of its' existence. This shows it should be visible with some luck in 6-inch and larger telescopes. Using the 36-inch refractor at Lick Observatory, S.W. Burnham found a total of 6 stars in this system. The remaining two are much fainter than star "D", and I suspect they would be challenges for telescopes in the 12-inch range and above. This is an observing plan for a winter star party attended by young and inexperienced observers. It features bright objects that are easy to find and mostly visible in small optics. It also includes examples of all the major categories of night sky objects. These objects are not challenges for experienced observers but they are a good way to introduce young and/or inexperienced observers to amateur astronomy. This is an observing plan for a spring star party attended by young and inexperienced observers. It features bright objects that are easy to find and mostly visible in small optics. It also includes examples of all the major categories of night sky objects. These objects are not challenges for experienced observers but they are a good way to introduce young and/or inexperienced observers to amateur astronomy. This is an observing plan for a summer star party attended by young and inexperienced observers. It features bright objects that are easy to find and mostly visible in small optics. It also includes examples of all the major categories of night sky objects. These objects are not challenges for experienced observers but they are a good way to introduce young and/or inexperienced observers to amateur astronomy. This is an observing plan for a fall star party attended by young and inexperienced observers. It features bright objects that are easy to find and mostly visible in small optics. It also includes examples of all the major categories of night sky objects. These objects are not challenges for experienced observers but they are a good way to introduce young and/or inexperienced observers to amateur astronomy. Share your favorite night sky objects here! Contribute your own observing favorites. Email submissions to Web Editor Michael Masters. For more information or to request a public outreach event, contact RAC President Michael Masters via email or by telephone at 540-371-3410. Site Index Questions or comments about this web site may be directed by email to Michael Masters or by telephone at 540-371-3410.